So you have a projector and are tired of throwing images onto the living room wall. There are always shadows or something in the way, and a bed sheet just doesn’t do the job. A great solution is an inflatable movie screen. Yes, these really exist! Haven’t you always wanted your own movie theatre? Revolutionize the way you throw parties (and watch movies) with a portable, inflatable screen! Why inflatable? So that it can stand on its own, of course. The screen also comes with tethers and yard stakes for securing it while in use. Why portable? So you can move it around, set it up where you want, and take it on fun trips, of course! The inflatable movie screen by Gemmy measures twelve feet wide, perfect for backyard bashes or family nights. It comes with two fans that blow air into the screen from either side, keeping it fully inflated and standing upright while you view your favourite movies, TV shows, or slideshows. It is superbly simple to set up and very easy to use. This is the perfect thing for showing documentaries and films to groups of up to 100 or so. The fan motors must stand on level ground to work properly, as they work by sucking in air through the bottom. The fans inflate the screen within minutes; its unbelievable how fast it works! For complete setup including staking down the screen and tethering it, it takes about twenty minutes. You will have to buckle the screen to the frame, and fasten the eight tethers. Four of them are long for the top of the frame, while the four shorter ones go at the bottom. 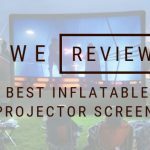 Watch this quick video review of the Gemmy Inflatable Movie Screen to get a closer look! As you can see, this inflatable screen has a very majestic presence, so much that it’s almost sublime. Friends and family will gather round in awe and laughter. (Note: the tethers are black, so have low visibility at night time. Make sure no kids or pets are running around while the screen is set up). The fans are quiet and you don’t hear them at all, especially while your movie is playing. Takedown can take about twenty to twenty-five minutes for the screen to deflate. Since the screen is inflatable, it is lightweight and doesn’t stand up well to wind. You can only use the screen in favourable weather conditions, with little to no wind. But that shouldn’t be a problem: who wants to sit outside on a windy day, anyway? If you must push on through a windstorm, you’ll have to make up something to keep the screen sturdy. For example, you could get some PVC pipe and fashion a frame for it. You may notice some wrinkles when the screen is done inflating, but fear not! They don’t show up while the screen is in use. It does come with a bag for storage, but it can be difficult getting it back in there, like a tent. We recommend grabbing a Rubbermaid bin, which will also better protect the screen from moisture, etc. The material and stitching is up to par quality, and as mentioned, there will be some wrinkles in the screen when you first take it out of its packaging. This is because it was folded for shipping purposes. We recommend rolling it up in the future to prevent more wrinkles. Once the screen inflates, the wrinkles will mostly disappear, but if they are still visible, you won’t be able to see them while watching your movie. There are clips along the sides that hold it taut, so this shouldn’t be too much of a problem. The base and inflatable screen come apart for storage purposes. You can purchase portable speakers that will plug into your projector to complete the entire setup. And once you have the screen, imagine the things you can do with it! 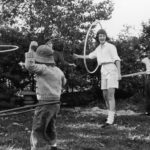 Neighbourhood movie nights, epic holiday family parties, kids’ birthday parties, radical documentary screenings, TV show marathons, Super Bowl parties, anything! It’s also super handy for weekends at the cottage or RV trips. It would also be great for holiday parties like Hallowe’en movie marathons, or Christmas movie screenings. We don’t have a pool at home, but are hoping that since we have the inflatable screen, our neighbours with the pool will invite us over for an epic backyard movie pool party! Inflating this screen will cause joy to spring from everyone’s hearts as they gather round the monstrous screen in anticipation of a night of fun. Twelve feet is the size of a bedroom wall. All you need is the projector and some portable speakers, and you’re on your way to setting up your own personal drive-in! Pull it all together with a popcorn maker, and people will be paying to hang out in your backyard. Trust.